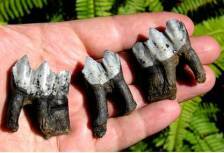 Camels and llamas evolved in North America and these camel llama fossils are very abundant in the fossil record, of Florida. The Camelids were most diverse in the Miocene Period and went extinct in North America by the end of the Pleistocene Period. Of the Camelidae, in Florida, three sub-Families existed: Aepycamelinae (Giraffe-camels), Florida Tragulinae and Camelinae. The Giant Late Miocene “Giraffe Camel” was Aepycamelus. This extinct camel lived, in Florida, during the Miocene Period 10-5 Million Years Ago. It had long legs and a long S-shaped neck, which gave the camel a height of 10ft. (3M). Considered fast runners, it had a pacing gait. This Miocene mammal lived in the grasslands. 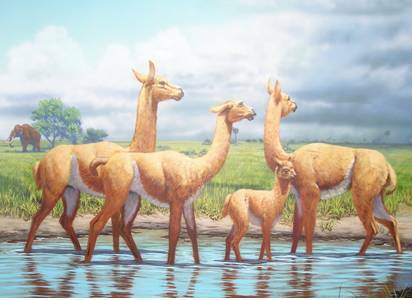 Other Prehistoric Camelids of the Miocene include three species of llamas or small camels. Nothokemas floridanus was of the early Miocene. Floridatragulus dolichanthereus was a strange early Miocene Camelid that had an unusually long skull and jaw. Oxydactylus was an early Miocene camel. The more commonly found prehistoric llama was Paleolama mirifica, "stout-legged llama", the one most closely related to modern llamas. It was a short, stocky-legged built llama that lived in the open grasslands, in Florida, and fed on grass and the leaves of bushes. It was most likely hunted by the Jaguar or Dire Wolf. 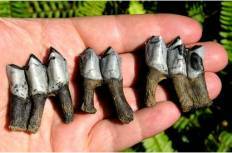 It shows up in the Florida fossil record about 2 Million Years Ago, in the Late Pliocene. 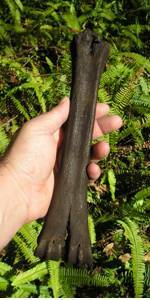 The largest amount of fossil material recovered, of this ancient Llama, is from Florida. The other common llama fossil is the large-headed llama Hemiauchenia macrocephala. This prehistoric animal was a very tall and slender built llama standing 9ft. (3M) in height. Camelids belong to a larger group of even-toed ungulates, called Artiodactyls. On average, they live 30-50 years of age. Old world camels have humps that store reserves of fatty tissue to give them energy and to help them survive without water for around two weeks and to go without food for a month. Camels are able to endure a wide range of temperatures and consume a great quantity of water that most other animals could not. They can fluctuate their body temperature during the day between 93F-107F (34C-41.5C), which gives them the ability not to sweat, so they maintain water. They are very adaptable to their environment.